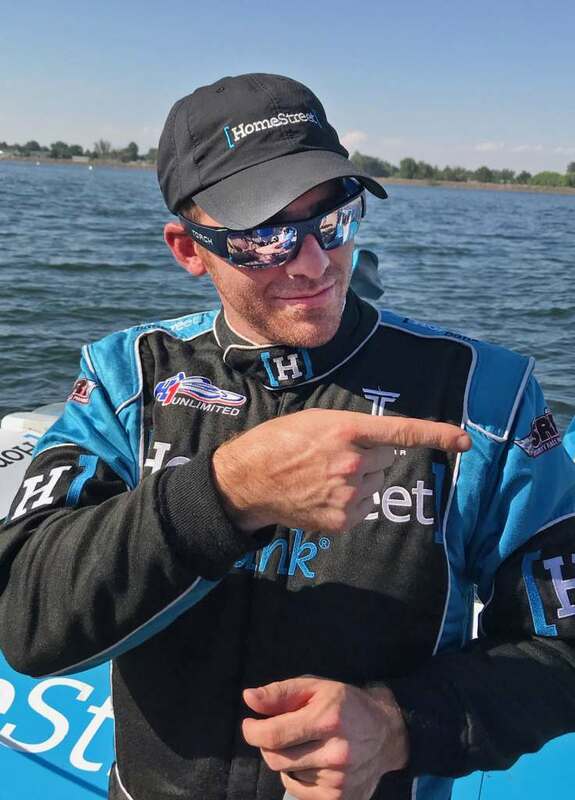 During qualifying for the 53rd annual HAPO Columbia Cup hydroplane race on Friday, Jimmy Shane (Maple Valley, Wash.), driver of the U-1 Miss HomeStreet, took the top honors with a 2-1/2 mile lap speed of 163.431 mph. Shane’s speed was 0.148 mph slower than the 2010 course record set by Dave Villwock in the U-96 Spirit of Qatar at 163.579 mph. “We were disappointed we didn’t break Dave Villowck’s course record, but happy we were top qualifier in the Miss HomeStreet. It was fast,” a happy Shane said afterwards. Although temperatures were unseasonably warm, the wind and water conditions were ideal for the H1 Unlimited hydroplanes. “That was some of the best conditions I have driven on in years. The wind and water were 100 percent ideal,” Shane said. Andrew Tate (Walled Lake, Mich.), driver of the U-9 Les Schwab Tires, was second fastest at 160.525 mph. “Of course we are disappointed,” Tate said after coming in second in qualifying. “But we have a great set-up for race conditions when we have four other boats out on the course with us,” he said referring to weekend’s preliminary heat races and final. The two drivers have been battling all season. Both have one win each and Tate has been the top qualifier at each event until today. Last year’s Columbia Cup winner, J. Michael Kelly (Bonney Lake, Wash.), who joined the fleet this week after missing the first two races with engine problems, was third fastest in the U-12 Graham Trucking with a speed of 156.260 mph. Cal Phipps (Avon Lake, Ohio) in the re-numbered U-1918 was fourth fastest when he took the Oberto Beef Jerky out after missing the last race in Madison, Ind., with damage suffered at the season opener in Guntersville, Ala., back in June. The remaining teams to qualify were: Tom Thompson, U-11 Reliable Diamond Tool presents J&D’s at 153.680 mph; Brian Perkins, U-21 Darrell Strong presents PayneWest Insurance at 153.599 mph; and the U-440 Bucket List Racing, driven by Dustin Echols (Sultan, Wash.), at 139.556 mph. U-3 Ace Hardware, driven by Jimmy King, attempted to qualify, but did not make the mandatory minimum speed of 130.000 mph. U-99.9 CARSTAR powers Miss Rock did not attempt qualifying. The two will be allowed to race on Saturday and Sunday, but received zero national points on Friday. 6) Brian Perkins, U-21 Darrell Strong presents PayneWest Insurance 153.680 mph.